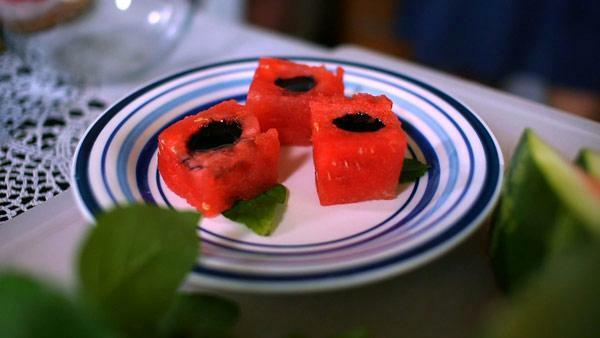 1.After trimming and cutting watermelon into 1x1 inch cubes, use a small melon baller to carve out the center of each cube. Make sure to leave the sides and bottoms in tact to hold the syrup inside. 2. Turn the cubes over on a paper towel to drain for at least 20 minutes. At this point you can also wrap lightly with plastic wrap and hold in the refrigeratorl for several hours. 3. When ready to serve, add just a few drops of Balsamic Reduction Syrup or Balsamic Creme to the center and place each cube on top of a mint or basil leaf.